Cluster – in ch sp indicated (yo, insert hook in ch sp, yo and pull up a loop, yo and draw through 2 loops on hook) three times, yo and draw through all 4 loops on hook. There is also a chart available here. The beginning chain should be a multiple of 12 plus 6. After the first row, make all stitches in front loops. Row 1: Dc in 5th chain from hook. Dc in each chain across row. Row 2: Ch 3. Turn. Dc in second dc and in each dc across. Dc in next ch. Row 3: Ch 3. Turn. Dc in second dc and in each dc across. Dc in top of turning ch. Row 4: Ch 1. Turn. Sc in first dc and in each of the next 6 dc. Ch 2, skip 1 dc, sc in next dc, ** skip 3 dc, work (3 tr, ch 4, sc) in next dc, ch 2, skip 1 dc, work (sc, ch 4, 3 tr) in next dc, skip 3 dc, sc in next dc, ch 2, skip 1 dc, sc in next dc. Repeat from ** to last 5 dc. Sc in each remaining dc in and in top of turning chain. Row 5: Ch 3. Turn. Skip first sc, dc in each of next 6 sc, ch 1, dc in next ch-2 sp, ch 1, skip 3 tr, sc in top of ch-4, ch 2, work Cluster in next ch-2 sp, ch 2, skip 3 ch, sc in next ch, ch 1, ** work (dc, ch 1, dc) in next ch-2 sp, ch 1, skip 3 tr, sc in top of ch-4, ch 2, work Cluster in next ch-2 sp, ch 2, skip 3 ch, sc in next ch, ch 1. Repeat from ** to last ch-2 sp. Dc in last ch-2 sp, ch 1, dc in each of last 7 sc. Row 6: Ch 1. Turn. Sc in first dc and in each of the next 6 dc. ch 2, skip (ch and dc), ** sc in next ch-1 sp, work (3 tr, ch 4, sc) in next ch-2 sp, ch 2, skip Cluster, work (sc, ch 4, 3 tr) in next ch-2 sp, sc in next ch-1 sp, ch 2, skip 1 ch-1 sp. Repeat from ** to last 6 dc and turning chain. Sc in each remaining dc in and in top of turning chain. Repeat rows 5 and 6 until afghan is desired length. After a row 5, work these final three rows. Third to last row: Ch 3. Turn. Dc in second dc and in each st across. Dc in top of turning ch. Second to last row: Ch 3. Turn. Dc in second dc and in each dc across. Dc in top of turning ch. Last row: Ch 3. Turn. Dc in second dc and in each dc across. Dc in top of turning ch. Finish off and weave in end. 4/24/17 – Added link to chart. love this afghan. thank you for the free pattern. I am having trouble with rows 5 and 6. I have ripped it out so many times and getting for flustered. Is there any chance that you might do a video on this afghan? On the brighter side I have made 5 of your no chain afghans as I am visibility challenged. Our church has started making prayer shawls which I am involved. Thank you for your time and patterns. I don’t have a good set up for making videos at the moment, so I’ve been accumulating a long list of requested videos. If you can describe what seems off about rows 5 and 6, I can try to add more insight. Are there specific points that are problematic? I can also make a chart if that is helpful for you. I don’t have a way to make a video at the moment. I would love to see a chart of row 5 and 6. Thank you in advance and for this wonderful blanket. I am also trying to make this beautiful baby blanket, but I see what Alfreda and Elizabeth are talking about for rows 5&6. In the written pattern, it does not tell you how to crochet 6 sc on each side for you to be able to turn your pattern with a ch1 and sc in each of the next 6 sc. Please elaborate. There’s not 6 sc to crochet in. On the edges you wouldn’t be making sc in sc stitches. Every other row has dc on the edges or sc. So the sc on the edge are always made in dc stitches and the dc stitches on the edge are always made in sc stitches. 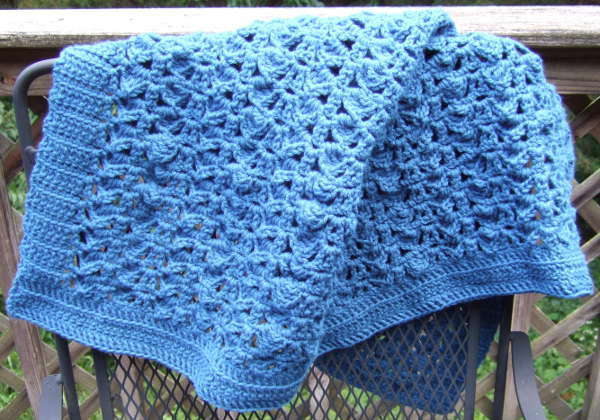 this pattern is so lovely—cant hardly wait to start one, as soon as i get finished with the one I am working on now. Thank U for the lovely pattern. I am assuming that “Cluster” refers to the triple crochet stitches, ch of 3 and single crochet . Is this correct? I desperately wd luv to see a TURORIAL on the butterfly lace afghan.. am having trouble with Row 5, don’t know if I’ve messed up on row 4, but just cannot get row 5 to go right. It is so so so so so lovely and I really want to start it but all I do is rip out afrer the 4th row. I haven’t had time to make videos in a while. I also haven’t had a good setup for making videos. Once school is out for the summer I hope to have some times to arrange a better video setup and get several videos done this summer. I will add this one to the list. Yes, I would like to see the videos which would be a lot easier and follow the instruction with the videos.. I love this afghan but I am having some trouble of how to do this. Many thanks and have a good and safe summer. I always look forward to another of your beautiful afghans. I absolutely cannot wait to start this one. I just wanted to thank you for sharing your gorgeous creations with those of us who love crocheting. Another gorgeous pattern! Thank you again for sharing! I have made several of your patterns now and I love how unique they all are without becoming impossible to follow! I wish I had your talent for coming up with crochet patterns! I’m sorry I’m just now getting back to you. Do you like charts? Beautiful blanket I would love to have the pattern. Hi! Can you tell me how many butterflies are in row 5 for the extra small blanket. I am having an extremely hard time! Thanks, Mama! I got it figured out; I had counted wrong for the foundation chain. This is turning out beautifully! Why don’t you show video on how to make the Afghan?Kenneth Maes? I haven’t had time to make videos for a while. I have this one on my list to make when I can.